I started writing this blog just a few days ago, so the past few posts have been a bit of catch-up. We’re just about to present-day with this post. One of the oh-so-many things that your momma’s worry about is what we’re going to call you. So far, you’ve just been Babies A and B in the ultrasounds. Some time in late June or early July, when you are born, one of the first things we get to do is give you each names. These are names that will stick with you for the better part of your entire life. You’ll actually get several names over time. First will be your official names — this is what we’ll put on your birth certificates, documents, school enrollments, and so forth. Then there will be the cutie names that we’ll actually call you. For example, no parent in their right mind would name their children “Stinker” and “Monkey”, but that’s what my dad called my brother and I growing up. Meanwhile, Momma-1 and her siblings were collectively known as Fargles. But we can’t really pick names for you just yet because we don’t even know if you are both boys, girls, or one of each. You see, some names go better with boys, and some names go better with girls. But right now, your momma’s are just starting to toss around various ideas. I’m sure there will be much more on that later. Of course, with two momma’s, we also get to decide what you are going to call each of us, too! Momma-1 will clearly be “momma,” but we’re not sure what we want you to call me just yet. I started by looking at the words for mother in various languages, and we may decide on something from one of these lists. On the other hand, we may also stick with Emtu. It’s the sound of M-2, for Momma#2. I kind of like it because it’s unusual, but we’ll decide for sure some time before you’re born. The day we had our first ultrasound with you two was quite exciting (November 17, 2008). There were previous ultrasounds before we put you inside on that shaft of light. These were just to make sure that everything was ready for you before you were put inside of Momma-1. But after you were inside and it was time to check on you for the first time, well, at that time we didn’t know that there would be two of you. Sure, there we put two specs of dust in, but there was a chance that neither one of you would grow. So when we saw that not only did you grow, but that both of you were alive and well, oh what joy that brought! Momma-1 was on the exam table while the ultrasound thing poked and prodded around, looking for where you two were hiding inside. 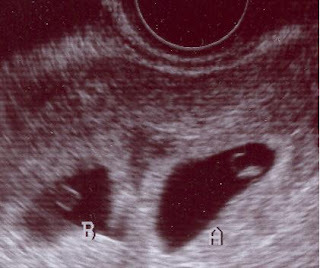 I didn’t know the first thing about how to read an ultrasound, but I was pretty sure that there were two blobs in there. I didn’t dare say a word as I watched. Instead, I just let the doctor do her work and look around. Then she confirmed what I already suspected — twins. Yes, that’s when we learned that there were two of you for real. I almost cried right there in the doctors office. My mouth was wide open, and all I could think was WOW! Two of them! WOW! At this point, you two were each less than an inch long, measured from head to tail. You don’t really have a tail… it just means the base of your spine. On the pictures, it’s hard to make out what you two actually are, but we know that you are to become our children. Well, you already are, except that we haven’t officially met yet. In just so many ways, that thought is really bizarre. I mean, here you two are, growing inside Momma-1, we know about you, we can see you on ultrasounds, but to the rest of the world, you don’t exist yet. Nobody knows you are there unless we tell them about you, and even then, to them you are “future people” until you are born. But to us, you are oh so very real, alive, loved, and eagerly anticipated. You have heartbeats already, and we can see them. I’m just so excited for the chance to finally meet you when you arrive! It would be another 10 days before Momma-1 would get the pregnancy test, but I already knew she was pregnant. I don’t know how… I just knew. Momma-1, on the other-hand, was cautions, patient, and wanted concrete test results to be sure. Oh, sure, many momma’s all over the world pee on a special piece of paper to see if they are pregnant, but that just gives a yes/no answer. The super doctors wanted to know HOW pregnant momma-1 was. OK, there’s pregnant, and not-pregnant, so the real question was how far along the pregnancy momma-1 was, and of HcG hormone levels. That’s what we were getting tested for. On November 3rd, 2008, we got the first test. I think we needed something above 300 to be a good score, and Momma-1 had something in the 600 range as I recall. Never mind that the doctors who were actually measuring HcG, I could not help but think this was actually your Midi-chlorian count. That was all the more true when just two days later, the score had doubled. Shortly after that, we really knew we were pregnant because momma-1 started getting sick in the morning. I did what I could to comfort her, but that’s not a great deal. She was in the bathroom praying to the porcelain god, and I had to put on a sympathetic face, all the while I’m thinking “goody goody!” because I knew that it meant the two of you were growing inside. I decided to bring up a cushion that Momma-1 could kneel on when she got sick. She thought it was unnecessary at first, but as the queasiness continued, she started using it after all. OK, so I said you were hatched. Normally, people think about birds like chickens being hatched, and not people. But you two, my dears, were definitely hatched. It’s something that those super doctors do with the very tiny people when they are somewhere around 6 days old — to the tiny spec of dust that eventually became the two of you. You see, the doctors took you out of the freezer, and as soon as you started to thaw, you started growing again. For most people, it’s about nine months from when the sperm and egg come together, to when they are born. That would be true for you too, except that the time in the freezer counts as a time-out. Kind-of a time-out-of-time (TOOT) thing. While in the freezer, all your clocks were stopped, and the rest of the world got older while you two stayed about three to five days old. So at about four weeks prior to taking you two out of the freezer, your birth mommy had been making a nest for you inside her womb. She had been taking special medicines called hormones to make everything just right so that when you were taken out of the freezer and thawed out, that we could put you into someplace warm where you could grow. To get you inside, the super doctors took a very small straw, sucked you up into it, and then blew the straw inside of Mommy’s womb. We got to watch the whole thing on TV. Well, OK, it wasn’t really TV — it was a computer screen that the doctor looked at to make sure that she was putting you exactly where you two could grow. When you were put inside, we couldn’t see you because you were way too small, but we could see the tiny air-bubble that you rode in on. It looked like the two of you arrived on a flash of light as the doctor blew on the straw. OK, it wasn’t really a straw either. It was the inside of a very tiny and flexible needle that was similar to a straw, only much smaller, longer, and softer, and to “blow” on it, the doctor used the other end of a syringe. So that was how the two of you came into being. At that point, we didn’t know if you would keep growing or not. All we knew was that we had placed these two, very tiny dust-specs inside of Mom, and we had to wait another two weeks just to find out for sure. Of course, if you’re reading this, then you know how it turned out, but at this point in time, we were still pretty clueless. Hopeful, but clueless as to what would really happen. I’ll tell you about what happened next in my next post. Where do I start? I mean, you two are not even born yet, and it’s going to be a while before you two can read. There’s just so much that I want to tell you, show you, and experience with you. We are both eagerly awaiting your arrival. Presently, you are only about 11 weeks old, though we got to see pictures of you just a few days ago via ultrasound. On the pictures, you still look like blobs, but on the video, we could see each of you wiggling around, waving your hands and feet. I couldn’t tell for sure, but I think one of you stuck your tongue out. We actually knew about you from before you were hatched. Yes, that’s right. You were both hatched. You were also both frozen, but I don’t know for how long. You see, you have far more parents than most children ever imagine. To say that you will be brought up in a non-traditional family would be a bit of an understatement. At some point in the not too distant past (probably within a few years), there was a couple who was unable to have children on their own. I’ll call them John and Mary. I have no idea why they could not have children, but they really wanted to have them. So John and Mary got the help of some super doctors who could help them have children. These doctors were able to take an anonymously donated egg from another mommy (call her Elizabeth), and a couple million sperm donated by an anonymous daddy (call him Bob), and bring them together. Technically speaking, Elizabeth and Bob would be your genetic parents, and neither one of your real parents (the two of us who will be raising you), know a thing about these people other than that they gave their genes to the super doctors. So, back to John and Mary. 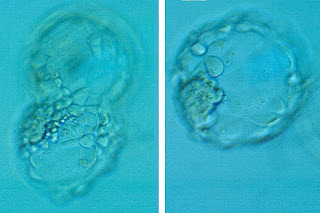 The doctors put a few egg and sperm together, and they made very tiny people with them. I’m not sure how many tiny people, but there were at least three of them… maybe more. Then the doctors put some of these tiny people into Mary-mommy, and they grew into children that Mary and John raised. These people would be your brothers and sisters, and we have no idea who they are. The rest of those tiny people, the doctors put into the freezer for safe keeping. Two of those tiny frozen people were the two of you. I have no idea how long you were frozen, but eventually, John and Mary had all the children that they wanted, and you two were still frozen. You were still very very tiny people, so you had to be taken care of or kept in the freezer. You were about 5 days old at that point, and smaller than a spec of dust. So John and Mary told the super doctors that perhaps there was another couple who might also need help with children. John and Mary told the super doctors to give you tiny frozen people to somebody else who could provide a good home. That’s when your birth Mom and I came into the picture. We couldn’t have children either, but the reasons are complicated. When you’re older, I’ll tell you about those reasons. For practical terms, its because we are both mommies. I’ll tell you more about being hatched in the next post.